A short 15 years ago, the larger American public was completely ignorant of the vocabulary of jihad. Now some terms that once were italicized and considered foreign—because they WERE foreign—have become woven into our daily consciousness and news vocabulary. But to still far too many, the terms introduced by the terror tsunami of the past decade and a half are still fuzzy. 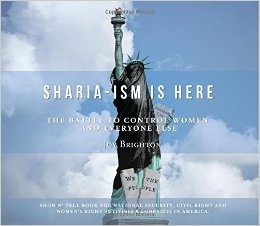 In Sharia-Ism Is Here: The Battle to Control Women and Everyone Else, author Joy Brighton brings clarity, citations, history and important supportive documentation to bear to clear up any uncertainty as to the differences between Sunni and Shi'a, laws and customs, and the whole directory of confusing terms. Until now, most citizens of the land of the free and home of the brave didn't really have a handle on what those words scrawled on walls in the Middle East, on placards during carefully planned "protests" calling for Death to America, Death to Israel!, or shouted down to audiences from mosque pulpits around the Umma (Arab world) even denote. Taqiyyah? What's that? When you know the words, you can describe the problem, address the situation, define a solution, and debate the disposition. But Brighton does far more than just provide a critically-needed clarification to the arcana of Arabic terms and misunderstandings swirling in the media cloud since the horror of 9/11 struck the innocence of the country like razor lightning. Sharia-Ism Is Here digs deeper than a dissection and clarification of Islamic idioms and vocabulary. The author analyzes the underpinnings of Sharia-ism, a term she crafted to represent the despotic system of Islamic laws that routinely runs counter to the U.S. Constitution and western egalitarianism, while demoting women to second class citizens and non Muslims to even less. She asks, Is Sharia-ism a religious movement against the West or is it a political one? We must, of course, learn the words. Brighton provides clear descriptive explanations in graphics, with helpful charts and useful photos. Terms that were mysterious challenges in Scrabble 20 years ago, such as "dhimmitude," "da'wa," "zakat," "jizya," "taqiyyah" and the many faces of apostasy are laid out not only with explanation, but documentation of when and how they are used in media, speeches by the clerics, documentation for the faithful, in the news columns. Brighton outlines the witting and unwitting enablers of sharia-ism in this country, focusing on former Vice President Al Gore. When Gore originally sold the rights to his TV network to Al Jazeera, with an enormous ready-made audience of some 40 million Americans (plus some Canadians), many defenders objected to characterizations of Al-Jazeera "news" as distorted, biased and anti-West and anti-Semitic: Its modus operandi has been to promote false and incendiary stories about the U.S., Israel and the moderate Arab world within a false veneer of trying to seem like a legitimate news outlet. Several years of programming have proved these detractors right. Many journalists hired from legitimate news outlets have left in disgust, as the original mandate for unbiased news has disintegrated. Staffers now admit that the channel is biased against the West, against the U.S., against Israel and any faith group other than Islam. Several are pursuing lawsuits against the network elites because, true to form and the dictates of Sharia-ism practice, women are mistreated, ignored, paid less, and discounted for raises or promotions. If you have hearkened up to al Jazeera and have this handbook, you have won half the battle. Before its publication, few had the goods to dispute what was being broadcast with attractive news anchors, their silken voices and well-coifed heads mouthing one thing in English, quite another in declarative Arabic. This is a book that provides an-depth response to that new legal stranglehold exerted on those who dare to spill the truth about Sharia manifestations in the country and the world. Legal "lawfare" is limned, with some of its recent victims, a slow-but-steady strategy to silence those who dare to criticize Islam or any of its savage and primitive manifestations. Lawfare stealthily and expensively aims to vitiate the First Amendment, using often flimsy and tenuous excuses for lawsuits attacking well-researched and noble authors seeking to tell the truth about scurrilous regimes, dictatorial excesses against women and children. Or the blatant censorship of TV icons like the satiric geniuses of "South Park" and "Draw Mohammed" conferences such as the one held in Garland, Texas, which drew two would-be assassins to murder the free speech organizer of that event, Pamela Geller, and its attendees. We read the advent of "libel tourism" whipping scholars like Rachel Ehrenfeld in a landmark case that spurred a protective legislation. If you shut down writers by bankrupting them in court, you win the battle to mute their criticism. Chapters on certain imams in U.S. mosques include charismatic indoctrinators in Jihad and recruiters for terrorist plots on American soil, notorious campus derelictions, even terrorist front groups like the Council on American Islamic Relations (CAIR), born directly out of Hamas, but invited to the White House, State Department and treated uncritically by the mainstream media under their patently false veneer as absurdly re-invented "civil rights" groups. Readers get the pillars of the terrorist-supporting Muslim Brotherhood, in Egypt and the States: "Jihad is our way; Dying in the way of Allah is our highest hope." Unique on the library and bookstore shelves, the book is a handsome must-have. It charms the reader to browse through chapter after chapter, study the colored flags, diagrams, personalities, call-out quotes and famous celebrities on the multi-various aspects of the insidious sharia-ism arena. After a thorough browse, the book is invaluable tool to refer to when newspaper op-eds – or the current pro-Islamist/anti-Israel White House administration, in speeches long on fantasy, short on fact – whitewash the dangers of radical Islamism, refusing even to utter that term. This is a must have book that will dispel the phobias, ignorance and PC'isms annexed to the cauldron of Islamism today. Armed with this comprehensive reference, one can fight back the deliberate apologists for radical Islam in today's PC culture. This is an account that is politically imperative and historically critical to read and even memorize if one wants to join a new cultural war designed to roll back the insidious growth of Islamism throughout American society. As many savvy pols have noted, he who defines terms wins the battle. Which is where Brighton starts: Words? Phrases. Shibboleths. Speakers of the words? Spinners of the lies. As well as defenders of democracy. Brighton does not shy away from naming those who fail to combat or recognize the reality of the entire spectrum encompassing the threat of radical Islam from politicians to the high priesthoods of mainstream journalism from the editorial boards at the Washington Post to the New York Times that reflexively embrace the Islamists' fabricated claims of "Islamophobia," a term designed with one purpose only: to intimidate, silence and smear the critics of radical Islam. Our leaders fail to identify the reality of jihad and so many of the extremist ideological fanatics bent on world conquest. Just so, Brighton's book aims to de-fang the opposition, ignorance, by slicing away at the fuzzy foundations of poor understanding. Brighton holds nothing back in setting out the degrees of difference in those seeking to establish their woeful global caliphate. It's a preemptive stare at the works of the juggernaut Ozymandius, what it takes to keep it all in bloody motion. More than one pundit has predicted its implosion and demise. The jury, however, is still out. Takeaway: A pleasing, uniquely sized, soft-cover guidebook with pages of photos and the necessary evidence of an ultimately planned destruction of the West. Marion DS Dreyfus writes frequently for major publications on terrorism, politics and immigration; art, film and theatre. She teaches at the college level in the New York area and travels extensively, learning about the subjects she writes by extensive personal research. For an article dealing with the importance of words, it is discouraging to read that "Ummah" is defined as "Arab world". No! "Ummah" is the worldwide Moslem community, most of which is not Arab. There are also many Arabs who are not Moslems and, therefore, not members of the Ummah. Moslems consider their worldwide community, Ummah, to be a nation in every sense of the word. According to the Koran and Muhammad, the Ummah nation is in a constant state of war against non-Moslems until Islam triumphs in the world. Viewing the worldwide Islamic religious community as a nation also explains why apostasy from Islam is considered treason and punishable by death: a Moslem who foresakes Islam is leaving his nation (Ummah) and going over to the enemy camp of non-Moslems. The concept of Ummah as a nation also explains why a religious Moslem cannot be loyal to any country. A Moslem's primary loyalty is always to the Ummah. There are many examples of this phenomenon, of which Nidal Hassan, the Fort Hood mass murderer is a prime example.